Pisac is located approximately 19 miles northeast of Cusco in the Sacred Valley. 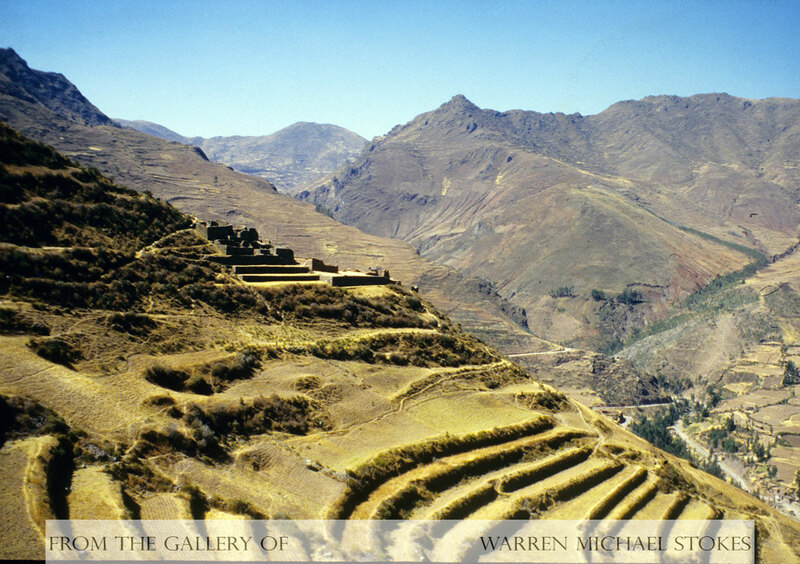 According to research historian Maria Rostworowksi, Pisac was the site of one of Pachacuti Incas first conquests. Here Pachacuti defeated the Cuyos, and afterward he constructed one of his many royal estates. It is said that Pachacuti enjoyed coming here for the relaxation. The guides that work here tell us that the entrances to this city were guarded at night by pumas. It is believed that in the midst of the central group of ruins, which are called the inti-huatana group, there was a replica of the Inca Sun Temple or Coricancha. The view from Pisac is incredible and everywhere you look there are amazing agricultural terraces. These terraces were especially designed to be used with Inca foot plows. Pisac's terraces produced much more food than was needed in Pisac, and most of the surplus products were grown for Cuzco's much larger population. The terraces have been restored, but the local population prefer oxen, and oxen are too big for the terraces. Irrigation channels plunge down the hill side feeding water to each terrace and to the baths and households. The ruins in Pisac are spread out into clusters. The four groups are called Pisaqa, Inti- huatana, Kinchiracay, and Qakaqasa or Kalla Qasa. The Qakaqasa contain the largest group of buildings in Pisac. The Qakaqasa is on the crest of the ridge and it contains many chambers and towers that are protected by a wall similar to those found in Sacsahuaman. In addition, there are fortified barracks here with outlooks and portholes that were clearly designed for defensive purposes. It is clear that Pisac also had a military role in the Inca Empire. There are twenty lookout towers placed strategically throughout the ruins and they come in different types. Some are massive watchtowers that are placed so that messages could be shouted from one to the other, and there are other towers that were used to store water for the elaborate irrigation system. The ruins in Pisac contain a group of thirty independent but uniform enclosures, which were probably used as apartments. These enclosures contain some of the finest masonry work found anywhere in Peru. However, it is important to note that the Inca also did a lot of construction with flat rectangular abode bricks which were packed with ichu grass for extra strength. Adobe came in the colors of brown and yellow. Also important in this group is a building with a spectacular view called the Mirador. The Mirador is considered by many to be the finest example of an adobe house in the Pisac ruins.